This year is looking very successful for the breeding of our resident White-bellied Sea-Eagles as their two chicks are growing well. They are both now fully feathered, and no longer need to be brooded at night to stay warm. In fact, the opposite is happening in the recent very hot weather, where the adults have attempted to shade the young birds. The adults continue to bring in a great variety of fish and several massive eels. The eaglets are grabbing the food now and beginning to feed themselves. They are exercising their growing wings and practising in the nest by gaining slight lift-off as they flap. They will soon try to make a little flight to another branch in the tree. The big milestone of their fledging of the nest for their first proper flight is expected in a week or two. 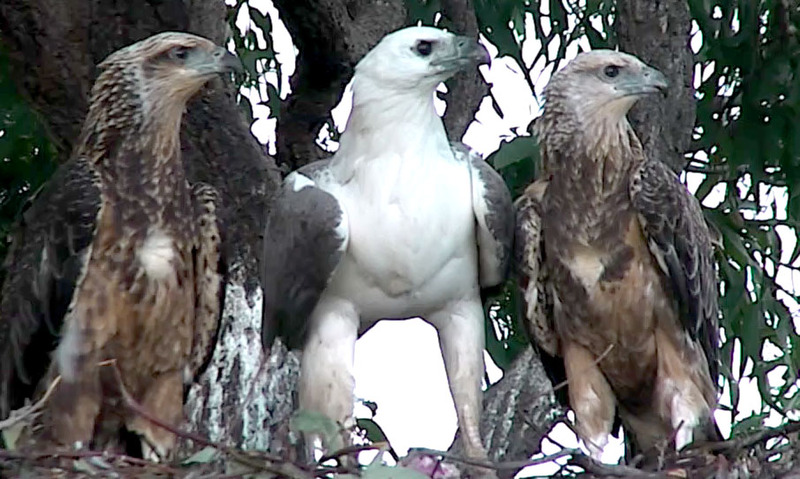 Watch this space, quite literally via EagleCAM, for their first flight! Wonderful photograph. What magnificent birds!